Premieres Thursday, March 6 at 8pm on FX. When FX spawned its sibling network FXX last year, several of its hilarious and subversive comedies like It's Always Sunny in Philadelphia and Legit left to help kickstart the new netlet's lineup. 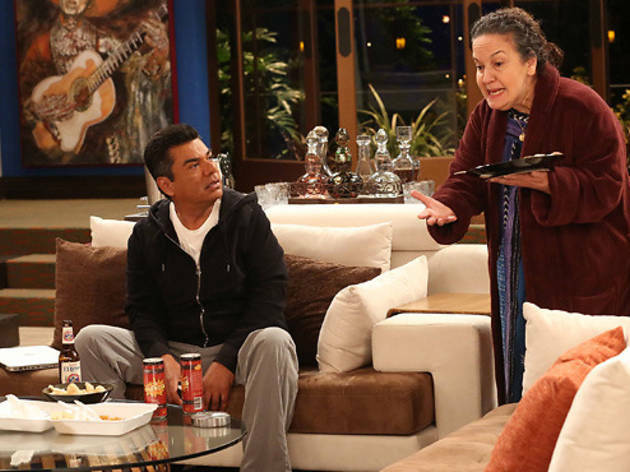 There are still some great comedies on FX like Archer and Louie, but unfortunately this new multi-cam sitcom starring comic George Lopez bears a strong resemblance to Charlie Sheen's Anger Management, an outdated series featuring a dull leading man. 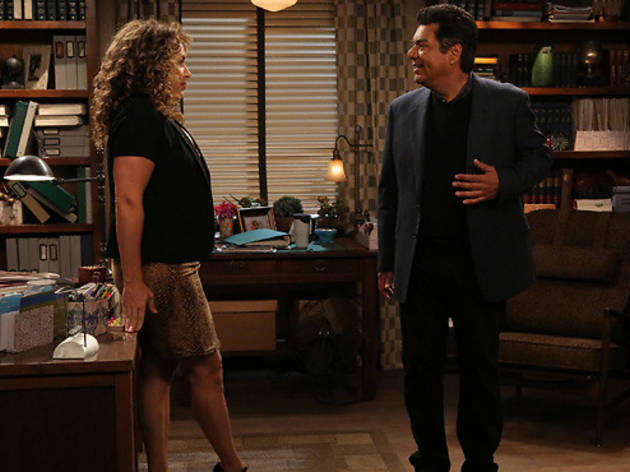 George (George Lopez) is going on thirteen months since he divorced his wife Mackenzie (Jenn Lyon) and has avoided dating again for fear that it will hurt her. After some encouragement from his uncle Tio (Danny Trejo) and cousin Junior (David Zayas), George finally decides to dye away his gray hair and follow his boys to a local hot spot to try his hand at flirting with the ladies. In his quest to find new love, George also finds himself fending off highly inappropriate advances from his boss Concepcion (Diana Maria Riva), the assistant principle at the night school where he teaches classes. It's not really a surprise that Saint George feels painfully dated given that Lopez's fellow creators Matt Williams and David McFadzean last graced TV when they helped create Tim Allen's Home Improvement in the '90s. The sets, plot and characters all feel like they've been copied from other sitcoms. Lopez's character makes for a fairly boring protagonist who rockets between being woefully inactive to the kind of guy who makes nasty japes about Concepcion's body type. With big personalities like Trejo and Zayas, who do the best with what they're given, Lopez struggles to be the focus of his own show. Stale and unfocused, Saint George is an unworthy addition to FX's prestigious line-up.